Thank you so much for stopping by! We are going to be having loads of fun today. I am so excited for Oak Tree's new releases!! Make sure to visit my fellow DT Brothers & Sisters and their awesome new release inspirations. 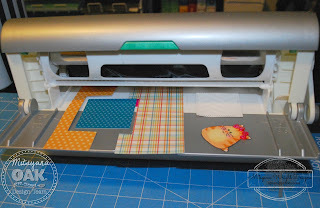 As an extra special treat, I will choose a winner at random to win a stamp set from Oak Tree Stamps!! 2. Leave a comment bellow. The winner will be chosen at random. Sorry, you do not get to choose which stamp set you'll receive. Stamp set will also be chosen at random. Another lucky winner will be chosen at random to win a bundle of 5 stamp sets from Oak Tree!!! EEEEKKKK!!! Check out the OAK TREE RELEASE Event (on facebook) for details on special event discount pricing and amazing deals!! absolutely adorable set call Cat-titude!! Isn't it stinkin' cute or what??!! 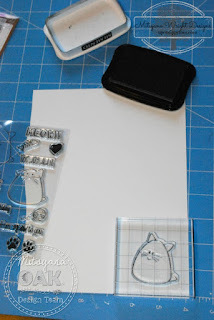 I started by stamping my kitty from Oak Tree's Cat-titude stamp set onto Illustration paper with Momento Tuxedo Black ink. Then I colored the kitty in using Spectrum Noir Alcohol ink markers. I used TN1 for the face and tummy areas and around those edges I blended it with GB2. For the kitty's stripes, I used TN3 and then TN5. I also blended a little bit of FS9 in between the whiskers and mouth to create a muzzle. Then I applied hot pink chalk using tiny circular motions for the cheeks and then I used a white opaque pen to add dots to the cheeks. Lastly, I added I glued rhinestone bows to both her ears using Diamond Glaze. and also applied a small dot between her whiskers to make her nose. 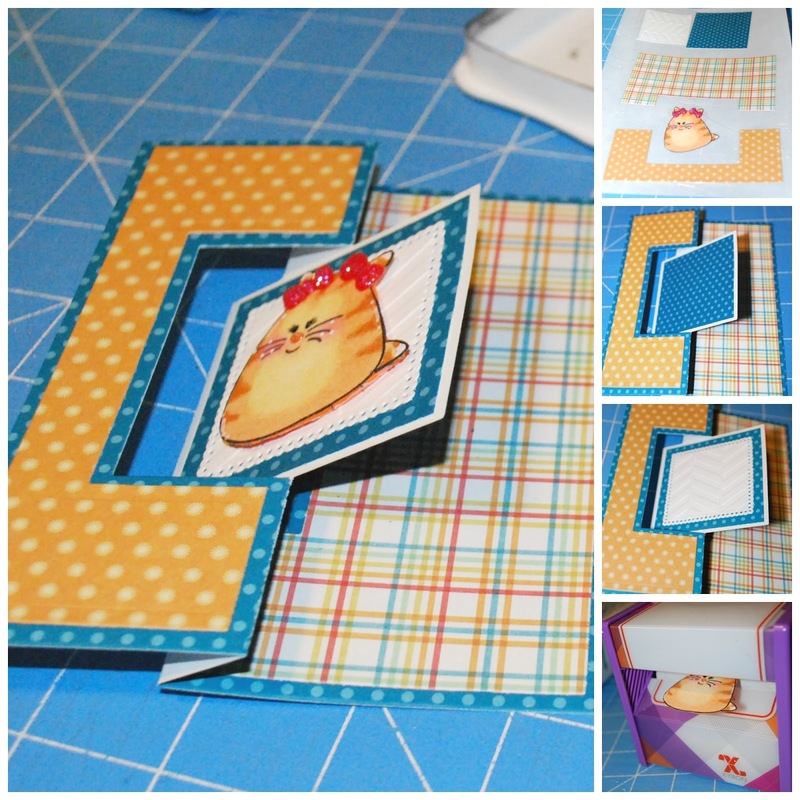 I used the Sizzix Fip-it Cards #2 for my base and panels. For the center flap, I cut a 2.5"square with the same paper I used for the base. For quick and easy placement, I ran my pieces through my Xyron Creative Station with a 9" permanent adhesive refill cartridge. Then simply peeled and stuck into place. I added dimension to my kitty by applying her to a sheet of foam and then running her back through my Xyron, this time my 3" Sticker Maker. 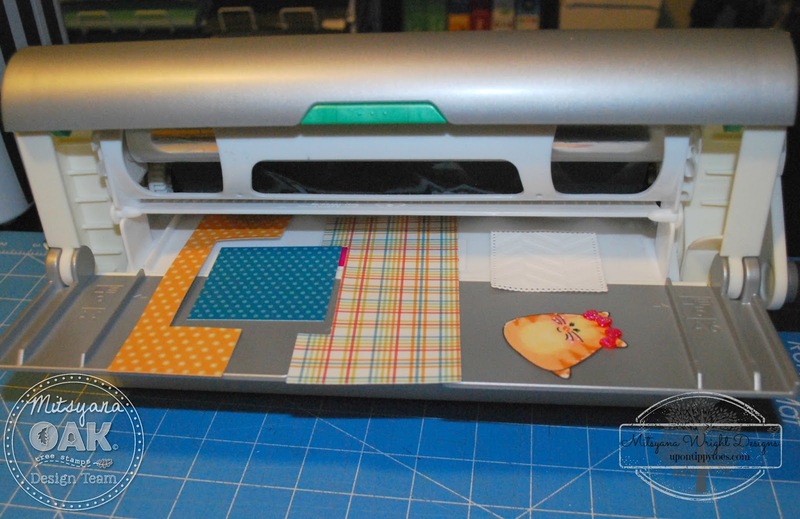 I also cut another 2.5" square for the back of the flap using the same patterned paper as one of my side panels. 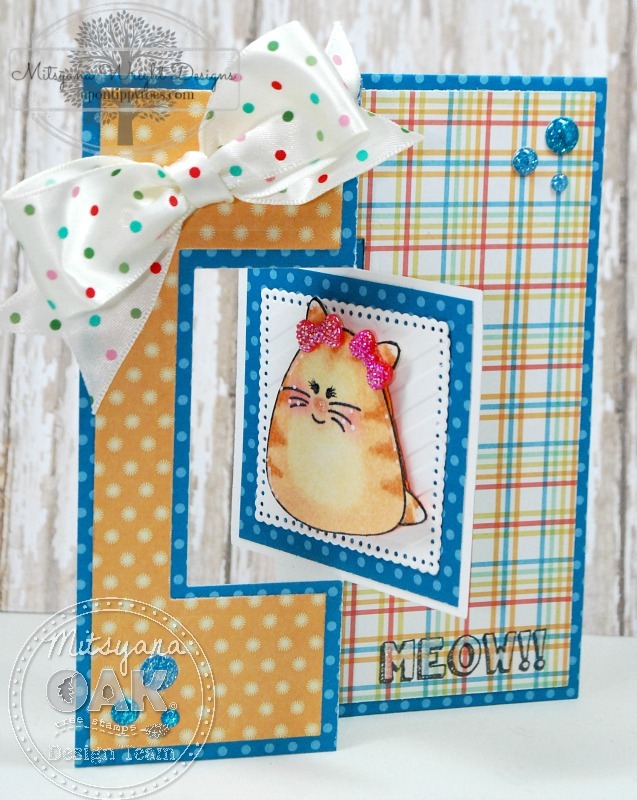 Finally, I added a simple bow and a few enamel dots to even out all four corners of my card. I hope you enjoyed this quick peek at the new release from Oak Tree Stamps!! Stay tuned because my awesome Oak Tree DT Sisters and Brother will be sharing more new release inspirations soon!! Wow, I just love this cat. I think it is so adorable and by using markers you get to customize the colors and look of it! 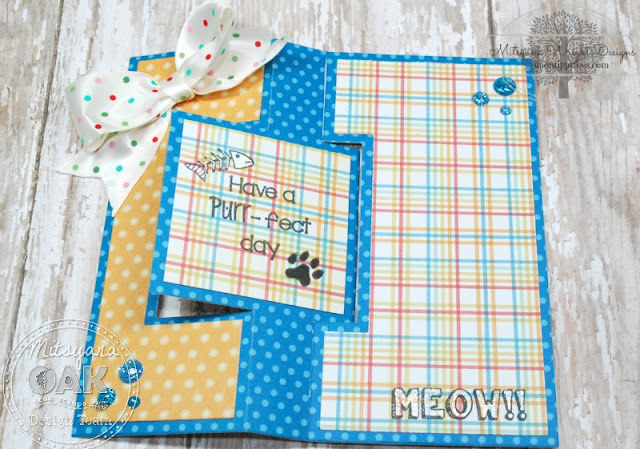 This flip card is a great way to display the cat and greetings! Love IT! Absolutely gorgeous!! Love this beautiful card!! So, so cute! I love how her attitude comes through. Wow! 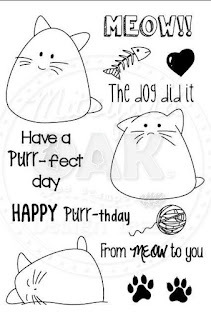 Love the cat stamp set. I bet that Xyron did make your placement super easy!! Love the die for the flip card too. I need to look into getting that. Thank you for all the progress photos and instructions. Great card!! 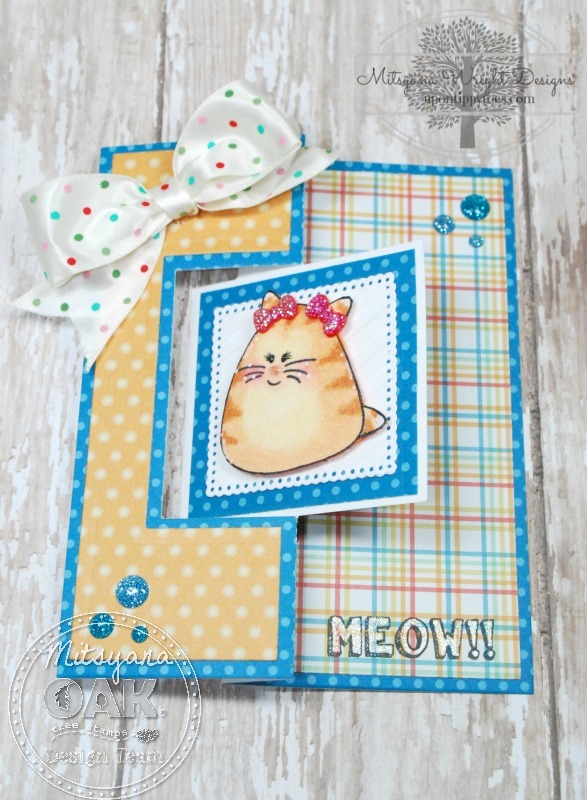 Really like the flip it card... and what a "purr-fect" stamp! So adorable! I love the little bows on her ears! Love your coloring! Beautiful card! Thanks for sharing! Love the cat stamps! This card is amazing! Your card is amazing! 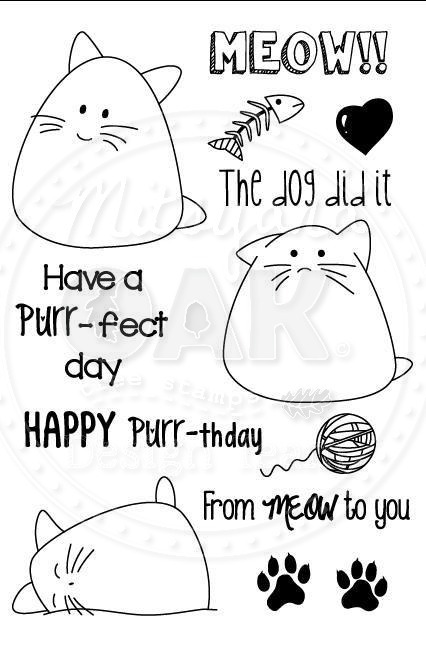 Love the cat stamps! Awesome card, thank you for sharing. oygs.. fur baby overload... this creation is so adorable... love it.